I am currently doing research on arsenic toxicity in microorganisms, and I learned about arsenic (V)/(III) cycling. Arsenic (III) (usually in the form of arsenite) is generally 50 times more toxic to biological life; however, most bacteria (or at least some) reduce the less toxic arsenate into arsenite. I just do not understand why these organisms would reduce arsenate into something more toxic. This doesn't seem to be an accidental reduction in which the microorganism mistook arsenate for phosphate, as there are plasmids specifically encoded with genes that reduce arsenate. Why is this happening? How would this be an advantage in these organisms and not a disadvantage? Arsenic resistance is ubiquitous among bacteria, they virtually all maintain the ars operon. Among Arsenic-resistant bacteria, this is not an advantage, but Arsenic was and remains a ubiquituous substance and being resistant to it confers an advantage over those that aren't; which is why bacteria that save themselves the effort aren't abundant. 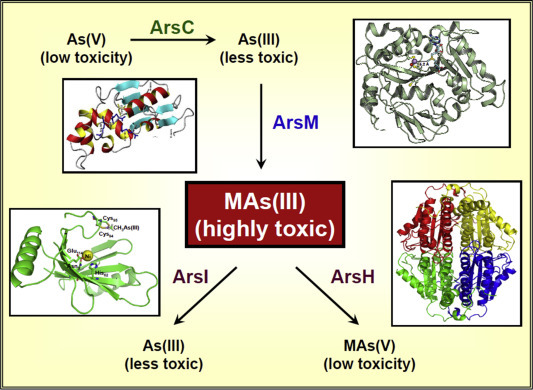 ArsM transforms inorganic arsenic into a highly toxic organoarsenical species that kills off by competing the bacterial species and may also be responsible for carcinogenesis in animals. Competing microbial species have responded to this environmental pressure by evolving detoxification mechanisms for MAs(III). Some produces ArsI that demethylates MAs(III) to less toxic inorganic As(III) while other produces ArsH that oxidizes MAs(III) to nontoxic pentavalent MAs(V). It is likely that all of these processes are taking place in environmental microbial communities as bacteria, archaea, fungi, and protozoans constantly fight for dominance. they are required for resistance to arsenate, which became the predominant arsenic species after oxygen appeared in the atmosphere. Simply put: If I can make a poison that kills you but not me, why shouldn't I make it? Definition of Dye- Reduction Test? Can we investigate the cell biology of extinct microorganisms?